This month's Featured Garden was created by landscape designer --and long-time SDHS member-- Frank Mitzel of Aesthetic Design and landscape designer and contractor Randy Laurie of Laurie’s Landscaping. SDHS Program chair, Mary James, wrote about this month’s garden for San Diego Home and Gardens Lifestyles Magazine in July 2011. You can full the full article on Laurie’s Landscaping website at: http://www.laurieslandscaping.com/sdhg_0811_garden_Arista.pdf. The garden is about 4 1/2 years old. At that time it was bare soil. There had previously been 2 homes on the garden site and it also functioned as a parking lot for the work crews during the previous 2 1/2 years while the home was being renovated. 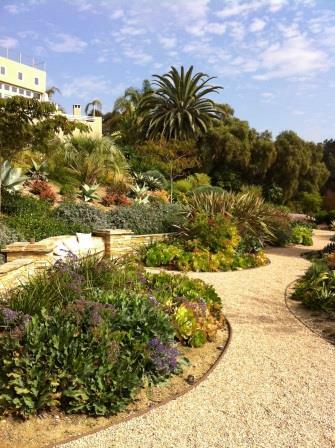 The designers toured other gardens to get an idea of what types of plants the owners wanted. 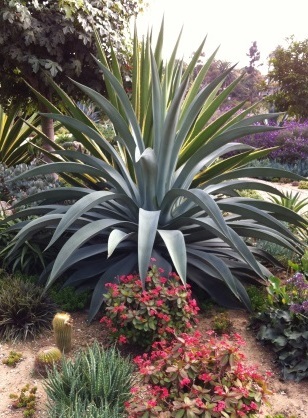 The garden is low water, low maintenance, features many varieties of aloe, agave, and cacti, and Randy wanted to offer something different and interesting around each corner with regard to form, textures and colors. The results are incredible and park-like. The garden sits just above Old Town and also has outstanding view. The property has over 30 irrigation zones and an on-site weather station. The Hunter ET System monitors actual climate conditions, and calculates the local evapotranspiration factors, to replenish on only the water needed for each zones plant and soil parameters. The weather station is connected to the controller, and the controller is connected to one of the owner’s home computers. Randy connects remotely to the owner’s computer to monitor the system and make adjustments as necessary. Please note that entry to the garden is on foot down a very steep driveway. Parking is on neighborhood streets above the house. The house will not be available for touring.